As you can see, there have been some significant changes. 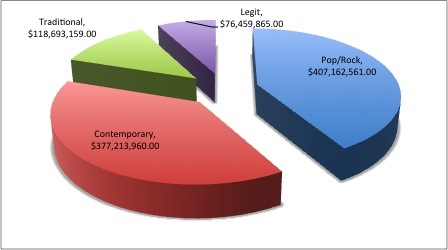 The percentage of pop/rock has increased from 35% to 42%; Contemporary musicals have increased from 26% to 38%; Traditional musicals have remained steady at 12%; and Legit musicals have dropped from 27% to 8%. 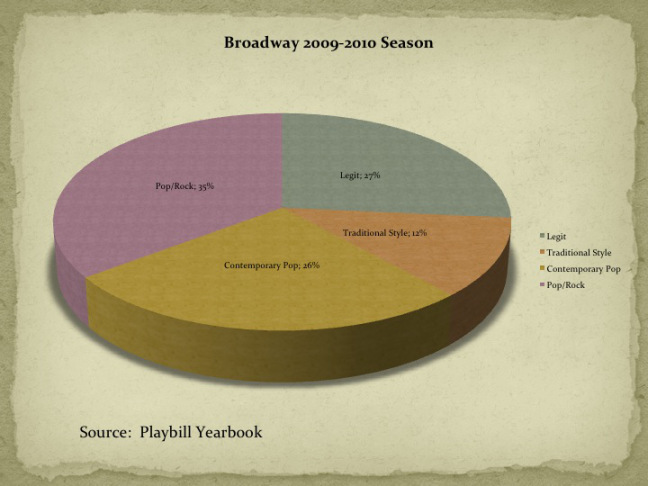 When I spoke at the Indiana University New Voice Educator’s Symposium in 2011, I predicted that we would continue to see the rise of pop/rock singing on Broadway and an unfortunate decline in legit musicals. 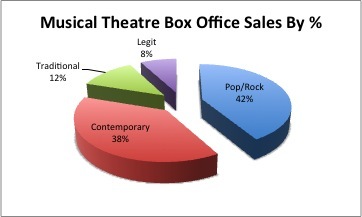 My predictions have come true; Pop/Rock musicals are here to stay. I think there will always be varying trends in the popularity of traditional and legit works, but I think for the next few years we are going to see more of the same. *There have been some comments that it is questionable to consider this song “legit.” My decision to label this show in this manner was based on several casting notices that asked for “legit” voices as well as reviews that remarked on the scores operetta style. ← Should I let my kid get a BFA?